Each quarter, as T-Mobile keeps pushing on with new phases of its Un-carrier movement, we look forward to the financial results to see if the initiative is working. For the past four consecutive quarters, T-Mobile has improved, adding more subscribers than every carrier except Verizon. Will it be a case of fifth time in a row? We’ll find out in a month. T-Mobile, today, announced that it is to hold its quarterly earnings conference call on Thursday, May 1, 2014. To listen in, you can log in to the webcast at http://investor.t-mobile.com. Following the call, you’ll be able to hear a replay for two weeks and can be accessed using the details stated within the press release. BELLEVUE, Wash., Mar 27, 2014 (BUSINESS WIRE) — T-Mobile US, Inc. TMUS -0.53% will host a conference call to discuss its financial and operational results for the first quarter 2014 on Thursday, May 1, 2014 at 9:00 a.m. Eastern Daylight Time (EDT). T-Mobile US, Inc. will issue a press release reporting its results at approximately 6:00 a.m. EDT. Be sure to set yourself a reminder for May 1st. Of all the earnings reports from the past 12 months, this is potentially one of the most exciting/interesting. 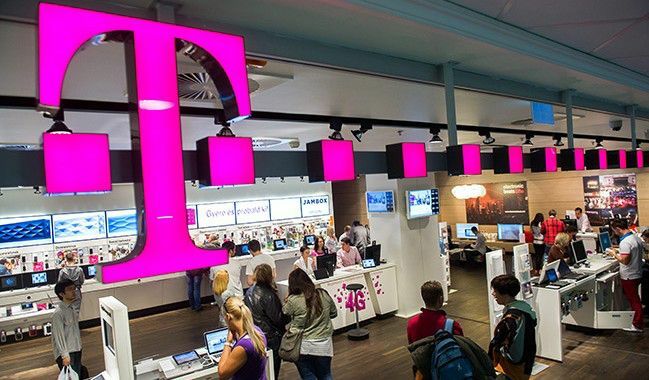 In January, Tmo announced its Contract Freedom plan, in which it offered to pay customers’ early termination fees to leave their existing carriers and join T-Mobile. I’m sure we’ll hear numbers on how many customers took advantage (unless the numbers weren’t that high). From a revenue perspective, we might finally see T-Mobile show some signs of financial growth too. When I was in Bellevue a couple of years ago, I was right beside the T-Mobile building and I couldn’t even find it because apparently they were too embarrassed to put their own name on the building. Don’t blame them, 2012 was a horrible year for them. T-Mobile is one large step closer to becoming the nation’s 3rd largest carrier. Expect no less. No huge surprises here. This train will continue to streamroll along. That could happen, there is now a very small gap size in subscribers between Magenta and Mellow Yellow. No doubt. I predict T-Mobile will pass Sprint in Q2 or Q3 of 2015. It’s very possible for sure. I just took into account a couple factors like Sprint being able to actually gain some customers in the near future or T-Mobile possibly losing a little steam. The future is always uncertain, so I just tempered my expectations a little. i would say as early as q4 ’14 honestly. q1 is going to be a boost. As of the end of last year, it was somewhere in the 6 million customer range. The most recent numbers I knew as of Q4 2013 are T-Mobile 46.75m and Sprint 53.9m. I know, it’s hard to believe after all these years of Sprint bleeding customers that they still have nearly 4 million more than 50m sheez! Being the only carrier that offered unlimited data for a while would make sense. Even I was debating switching to them then T-Mobile started capping. A lot of those “subscribers” are tablets and the Sprint Phone Connects which are usually complimentary devices but technically can be counted as subscribers since it is active on the Sprint “Network.” Tablets were basically given away at a super steep discount. The Phone Connect is basically just a Sprint phone that can only be used at home. Sprint also has some pretty big contracts with companies like Enterprise and Anheuser-Busch that they will basically do anything not to lose those contracts. I know at least one of these companies was looking to switch soon but I’m not sure which. I think what you will see a larger dip in Sprint subscribers soon as they will start to lose big contracts. A good example of this is the San Diego Police Department. Search for “Sprint San Diego Police” in Google. I would post a link but the comment would just get blocked. sorry for off topic guys ! I had my unlock done on my GS4 in foreign country. It got unlocked for use on any gsm network worldwide but I am no longer receiving on OTA update and IMEI number on phone is showing 0000000000. I still don’t have the kiatkat software. What could be the issue here? Tmo rep said he doesn’t know why and suggested either a device change or try getting the updates from computer with samsung kies. sounds like whoever unlocked ur phone wiped the imei no. this means your phone will never work on tmo network in theory (surprised to see it working now). Only samsung or someone who has the right tools or rogramming box can restore it for you. Ye I am surprised it works…most times this happens IMEI gets blocked an no longer works. Maybe they did some software tweaks to unlock. I suggest hitting up Best Buy they have the Samsung section and might be able to do something for u. Good luck with that zombie device. Hope unlocking it in a non-legit way was worth it. What “foreign” country was this in anyway? They did unlock it, but they didn’t tell how. Hope you don’t resell it without warning the buyer. Good luck. Updating by kries makes sense though so not all is lost. Hopefully they don’t require an IMEI. Ignore these people in this thread, they’re just going to leave lame comments. There’s a solution in the XDA forums. Google “XDA Repair Samsung Galaxy S4 IMEI – Fix Galaxy S4 ” and that should get you where you can find the fix. We can’t post links in here. I had my S4 unlocked the “non-legit” way but I didn’t lose the IMEI. Hope this helps, or at least gets you in the right place to find an answer. Most of the perople here wouldn’t know anyway. legitimately unlock your device and you wont have these issues. its free to unlock through t-mobile. I have this friend of my that just switched all of his family plan to t-mobile right after he tested my phone in his truck. He used to be a Sprint costumer. He is a truck driver. He was so happy when he got beck and then he went to Sprint store in order to ask about his plan ommitment. The seals rep at the Sprint Store asked him – why are you asking for? Are you moving to T-Mobile too? He did not tell them anything but right after the Sprint Rep asked him at this way, he was just laughing at him. They all know about that. The only way T-Mobile will be #3 is if Masayoshi Son gets his way. That’s the only way, so enough with the blasphemy you all are spewing. The only way? The only way you say? Nahh…we see differently! Mr. Son is the only way to become #3, but not going about it his way. When Sprint falls, because I can hardly see them stablizing anytime soon, THAT is when Magenta becomes #3. Why will Sprint fall? Because their subscribers will jump to Magenta. Why jump? We have better pricing and faster speeds. 2 pain points for Sprint. Son won’t be able to build them up so they will fall. Of course, it isn’t surprising that he didn’t mention the takeover plans to an audience of 100 companies with whom he is trying to strike up an alliance. If he succeeded in creating a third power to match AT&T and Verizon, just where would that leave all the little guys in the audience? Instead of the duopoly he was attacking, they would instead be facing a triopoly, without the potential support from the two largest companies that might be considered their natural allies against the current duopoly. If he was to drop his takeover ambitions, the idea of building a hub-based infrastructure, based on the alliance of TM, Sprint and the other CCA participants, might well be the most exciting prospect for wireless consumers. The hub-based infrastructure is an interesting idea, but I’m not sure who benefits the most from the financial end. Who will maintain the towers and equipment? Those questions and details need to be ironed out. It’s a very interesting proposition that could lead to either slightly lower cost to consumers-multiple companies pitching in to cover towers and equipment-or a bit more profit for these companies. Or course, that’s assuming the profits would go to development. Time will truly tell what will happen. I don’t see the DOJ as cutting the industry down to 3 players. As unless Softbank was going to keep GSM and shut down Sprints crappy CDMA that would left AT&T as the lone GSM provider in America. ETF reimbursement is a company policy. Front line has not been directed of any “limited time” policy – it’s here to stay. ETF reimbursement is a company policy. not a promotion. Hmmmm coincidence they chose May 1? I think Johnny Boy wants to brag and show off how many new T-mobiles customers they have added since implementing this ETF buyout of contracts of other carriers in January. In December of last year T-mo had 46.7 million customers. So what better way of announcing this massive gain than a year from the date the deal closed with Metro Pcs and the same day T-mo became a publicly traded company TMUS US Inc. I expect this to be the biggest gains they have had of any quarter since implementing simple choice plans last March. Get ready y’all to hear Johnny Boy gloating about how T-mo broke the 50 million mark baby. I also expect T-mo to catch Sprint by the end of the year.